Every state – even district – holds a certain history which makes the state unique. Same goes to the state of Sabah. In some states, you will find the individuals living in the specific state preserving the memorable trademarks from the history as hard as they can, either to serve as a lesson, or as a remembrance for the happenings that had lead to the lives they are living today. The Mari Mari Cultural Village in Kota Kinabalu is one place which you can discover the footprints of the history, carefully preserved by the villagers in the village. Upon stepping into the Mari Mari Cultural Village, you will instantly feel as though you had been transported back to time. The carefully crafted surrounding is filled with the local culture’s atmosphere, base on the buildings and decorations around the village. This is something rare to be seen even in the state of Sabah. Thus, do not miss out this chance to experience a whole different experience and perspective which you will definitely not be able to experience in the big cities. The Mari Mari Cultural Village consists of a combination of the local Sabah tribes such as the Murut, Bajau, Rungus, and Lundayeh. The village’s atmosphere is the outcome of all the hard work and effort being contributed by the different local tribes with the passion to preserve what had been left back for them. For the local tribes, it is extremely important for them to remember the past in order to lead a better future, and this is exactly what we need to learn from them. Do not need to worry that you might get lost during your expedition in the village because there will be an expert tour guide which will lead you the way in the village, introducing and explaining about all the elements in the village. This is also one of the best ways to help you in enhancing your knowledge about the local tribes of Sabah easier. The villagers in the village are more than happy to invite you into their villages and to know more about them. 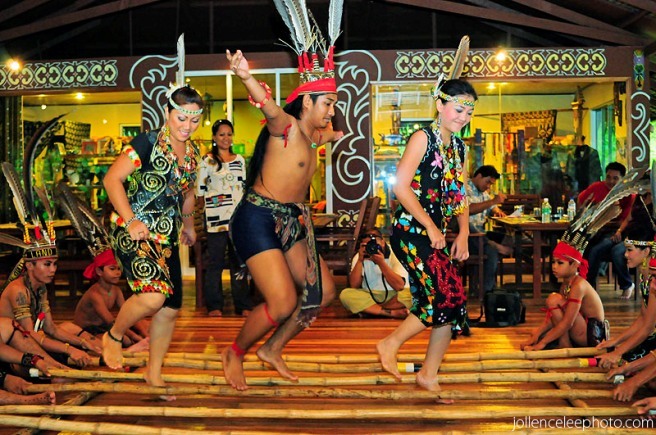 In the Mari Mari Cultural Village, you will also discover some historical footprints embedded along with the Borneo culture through the some buildings and also certain ritual ceremonies presented by the villagers. In the same time, you can also grab this chance to learn more from the demonstrations (blowpipe-making, tattoo-making) presented by the villagers. These are all important and meaningful traditions which had been passed down through many generations. You can now witness them all with your very own eyes in this village.